Anna Rosenberg was born into a prominent Jewish family in Budapest, Hungary, in 1902. Her father ran a successful furniture factory and her mother wrote and illustrated children's books. The family immigrated to the United States when her father lost his business after a large customer cancelled his order. They settled in the Bronx borough of New York City in 1912 and in 1919, she became a naturalized American citizen and married Julius Rosenberg. Anna M. Rosenberg would eventually shatter the glass ceiling that had divided women from the senior national military establishment when she was appointed assistant secretary of defense in 1950. Rosenberg began her political involvement in the early 1920s and quickly developed a reputation for expertise on personnel and labor issues that brought her into contact with Democratic politicos. It was during this period of time that Rosenberg first met the Roosevelts, and in 1928 FDR sought her advice on labor policy in his campaign for governor. In Albany, as in Washington, FDR continued to seek Rosenberg's counsel, and throughout the 1930s he continually tapped her to serve the federal government in a variety of labor-related positions. Although Rosenberg spent a considerable amount of time in Washington during this period, she remained active in New York state politics as well, serving as chairwoman of the New York State Constitutional Committee in 1937 and as a member of the New York City and state war councils. Rosenberg began her specific association with defense-related labor issues in the early 1940s with appointments to the Manpower Consulting Committee of the Army and Navy Munitions Board and the War Manpower Commission. This experience was deepened in July 1944 when President Roosevelt sent her to Europe to make manpower observations about the American military. For her service to Presidents Roosevelt and Truman, Rosenberg would be awarded the Medal of Freedom in 1945 and the United States Medal for Merit in 1947. Even after the war was over, however, Rosenberg remained active in the defense community, eventually serving as an advisor to Air Force Secretary W. Stuart Symington and then as assistant secretary of defense from 1950 to 1953. While at the Pentagon, Rosenberg worked hard to bring about the effective implementation of the National Security Act, took steps to promote racial integration of the services, and lent support to legislation that would safeguard the rights of minorities in the military. As a prominent Democrat, Rosenberg returned to private life after the Republican victory in 1952, briefly returning to government service at the end of the Johnson administration to serve on the Commission on Income Maintenance. In 1962, the Rosenbergs divorced and she married Paul G. Hoffman, the first administrator of the Marshall Plan and a top United Nations official. 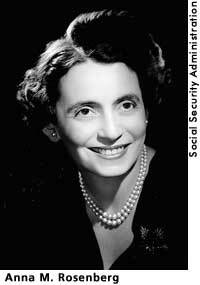 Anna Rosenberg Hoffman died in 1983, at the age of 81. Brody, Seymour. "Anna M. Rosenberg." The Jewish Virtual Library. Internet on-line. Available From http://www.us-israel.org/jsource/biography/ARosenberg.html. MacGregor, Morris J. Jr. History of the Integration of the Armed Forces. Center for Military History. Internet on-line. Available From http://www.army.mil/cmh-pg/books/integration/IAF-fm.htm. Social Security Administration. "Anna M. Rosenberg." Social Security Pioneers. Internet on-line. Available From http://www.ssa.gov/history/annar.html.